Why choose Keliiyo Indoor Weathe Stripping Seal ? The cracks and gaps are around our house doors and windows will cause so many problems, such as annoyed dust, noise, cold wind, water leakage, etc. 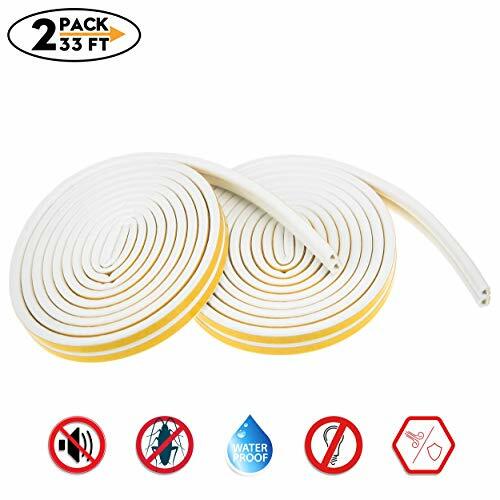 This weatherproof strip adhesive can get rid of all these problems, it has excellent windproof, soundproof and waterproof performance, help you block drafts and air leaks, help you save energy, maintain warm,quiet and comfortable indoor environment and bring you a comfortable life. Protect Your House Keliiyo strong anti-collision foam weather stripping against dust,water leakage proof. Provide a warm and cozy home for you! Give You a Quiet and Comfortable Living Environment & Protect the window and door, reduce abrasion and noise on window/door while open and close. & Reduce the noise from outside and the sliding door slamming, against odor, noise, wind, snow, give you a quiet and comfortable living environment. Wide Application and Usage & Our window door seal strip comes with adhesive, and it can be cropped according to your actual doors and windows size. & Easy to cut and easy to install, no requires specialist tool. & Widely used in all kinds of sliding window, sliding door, security door, closet door, wardrobe and etc, reduce damage of your doors and windows, protect your warm and beautiful house. 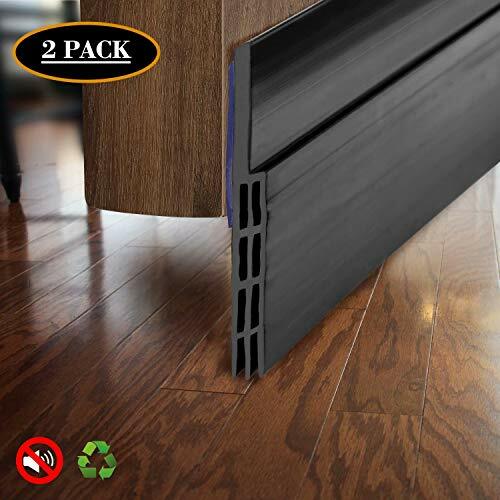 MULTI-FUNCTION] This indoor weather stripping with strong resilience after extrusion, good for anti-collision; great for preventing wind, dust, sound, cold, protecting the window and door, and reducing the abrasion and noise effectively on window/door while open and close. 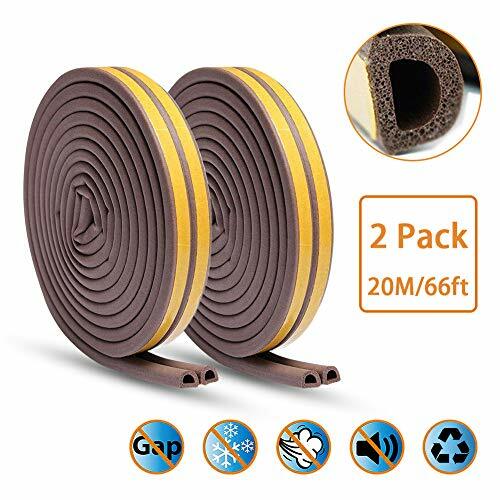 PACKAGE CONTENT 2 rolls D type window seal strip, bottom size approx. 0.354 x 0.295 Inch (9 x 7.5 mm), suit for gaps range from 1/5 to 7/25 inch (5 to 7 mm). Each roll tape can be divided into 2 seals(16.5in *2), total 66 Ft / 33 Ft(10m) per roll. 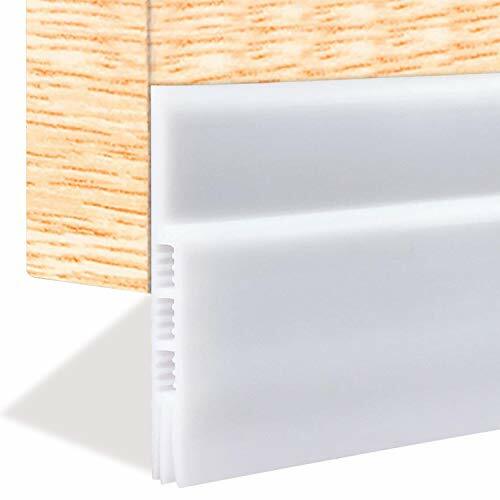 HIGH QUALITY This window door seal strip equably foamed by EPDM, same smooth interior and exterior, great elexibility, high resilience, super durable UNIQUE GRID ADHESIVE BACKING - strong grid adhesive backing, stick firmly, give your doors and windows long protection. USAGE& APPLICATION Our window door seal strip comes with adhesive, and it can be cropped according to your actual doors and windows size. widely used in all kinds of sliding door, sliding window, closet door, security door and etc, reduce damage of your doors and windows. Give you a quiet and comfortable living environment. 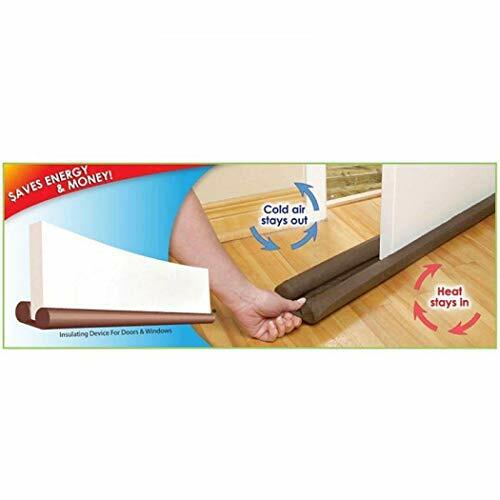 SECURITY&WARRANTY This insulation door strip kit made of environmentally friendly material, protecting health of your family, making you at ease. 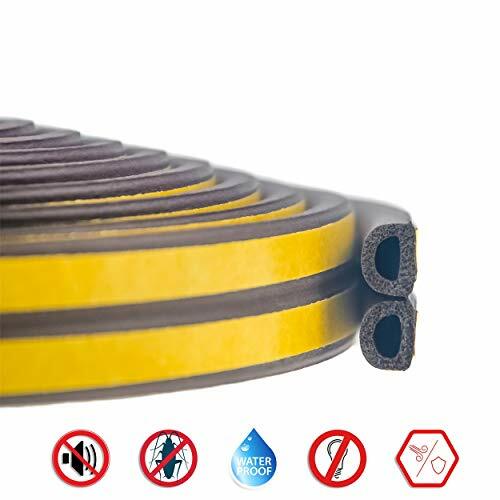 100% satisfaction guarantee, any dissatisfied with Keliiyo weather stripping tool, FULL REFUND or FREE REPLACEMENT, we will reply within 24 hours. Kit installs easily & stops energy escape. Click ADD TO CART now to bring new life to your old exterior door. 1 x Door Sweep 2" x 43.3"
To install weatherstrips, peel the backing off the adhesive side of the stripping, and press into the door frame. gap up to 1 1/8" big. CAN IT COME OFF AFTER INSTALLATION? door frame if you need to remove it. Add to Cart now to bring new life to your old exterior door. ALL IN ONE KIT FOR DOOR... to adhesive and seal it 360 , not just sides. The 43.3" door sweep fits all 4 styles of house doors, unlike 39" sweeps. The 39 feet weather strips tape seal the other 270 ! QUICK & EASY INSTALL... with a strong adhesive, peel & stick backing. It's strong enough to stay firmly in place, but can be removed without causing damage. SAVE ON HEAT, AIR CONDITIONING... by sealing in air conditioning in summer, or heat in the winter. Exterior door cracks are a major source of wasted energy & expensive power bills. 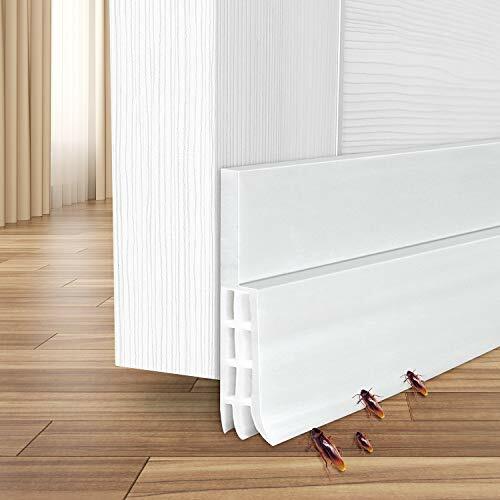 KEEP OUT DUST & BUGS... that sneak through door cracks.A tight insulation seal leaves no space for unwanted intruders into your lovely clean home (indoor, outdoor, doorway, garage, padding). Fed up with outdoor loud noise? 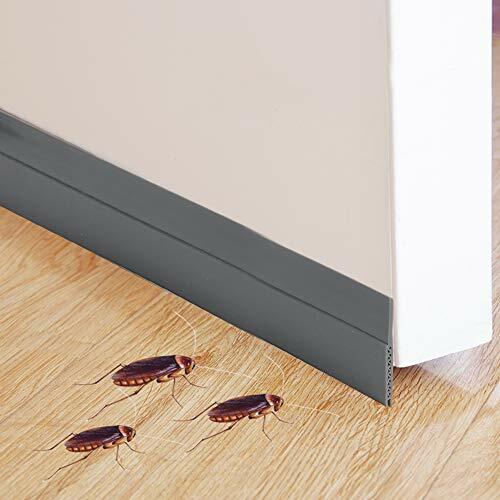 Tired of dust and bugs infiltrating your home? The Ohuhu Door Seal Strip is the perfect solution. This tough, water-resistant strip provides extra insulation that keeps the outdoors out. It's waterproof, soundproof, and extremely durable. You'll be able to use it for years to come. Better yet, this sealing strip helps to regulate your home's temperature- you'll save a fortune on your electric bill! The velcro strip provides easy installation so that you can enjoy a sealed door in no time. Tough and Durable: The premium silicone is non-toxic, water-resistant, and anti-scratch. It'll keep the outside out so that you can enjoy the peace and quiet of your home. It can handle any kind of weather or wear that it might face! Fits like a Glove: The luxurious smooth surface and sophisticated white color blends in perfectly with any home design and can seal a gap of up to 18 mm. 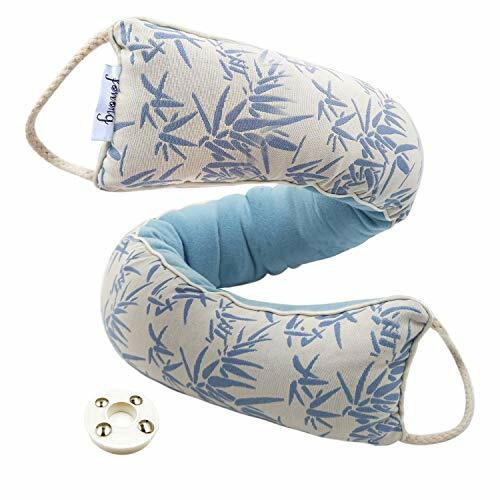 The tight fit prevents detachment and deformity, even after years of use! Effortless Installation: No tools needed! Simply stick the velcro strip to the bottom of your door and attach the seal strip. It couldn't be easier. NOTE: Please kindly note the adhesive may damage the door, it's no suggested to tear off the door seal once stickup, or be really careful if have to. 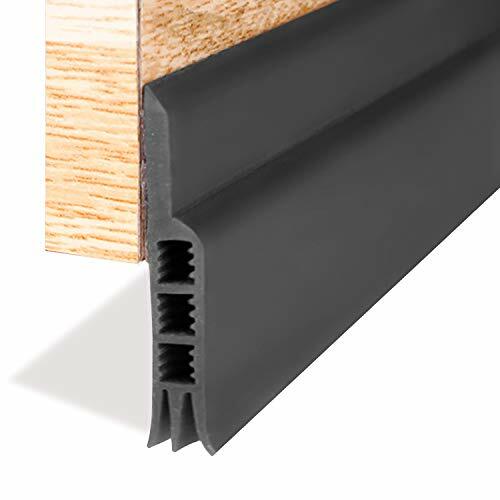 Waterproof Backing: The Ohuhu Door Seal Strip boasts unmatched water resistance and adhesion. It'll keep your home nice and dry, even in the worst storms! It's also great for bathrooms, laundry rooms, and anywhere you might need it. NOTE : Please stick the seal on the inside of the door, or the cold outside will freeze the seal. We only provide customer service / after-sale service and warranty for the products sold by 'Keeping Fun' and Fulfilled by Amazon. With the "Keeping Fun" indoor window insulator kit,you can lower your heating bills during the winter and make your home more energy-efficient. --Be sure you have cleaned the surface before installation.100% Brand new and High quality:Equably Foamed by EPDM, Same smooth interior and exterior, Excellent Flexibility, High Resilience, Super Durable UNIQUE GRID ADHESIVE BACKING - Strong Grid Adhesive Backing, Stick Firmly, give your doors and windows long time protection. --Wide Application :Widely used in all kinds of sliding window, sliding door, security door, closet door and etc, reduce damage of your doors and windows. --Multi-functional - it can be used for preventing wind, dust, sound, cold ,Protect the window and door, reduce wear on window/door while open and close.Waterproof, Wind proof, Excellent aging resistance.Multi-hole design to reduce noisy effectively;Strong resilience after extrusion, good for anti-collision; Windproof, dustproof. Package includes: 1 roll D type strip, size approx. 7/20 Inch x 6/25 Inch(9 x 6 mm), suit for gaps range from 5/32 Inch to 13/64 Inch (4 to 5 mm). Each roll tape can be divided into 2 seals,total 16feet / 5 meters per a roll. Three layer design, reduce sound up to five times. With this door bottom seal, you won't suffer from the noise any more. It takes long time to cold down in summer when you use air conditioner, that is because the cold air go aways from the crack under the door. This seals will block the cold and hot air cross, help you reduce electric cost. Fast and easy installation within 2 minutes, no need any tool.This model can seal gap of 0 to 1-3/32. Made of flexible and adjustable silicone for a snug fit, ensures door bottom seal is durable and easily attachable as well as removable. 100% MANUFACTURER MONEY BACK GUARANTEE 90 Days for a No-Question-Asked Refund,24h Respond E-mail Time,1 Year Warranty and Lifetime Support Guarantee. Size: 1.3inX0.4inX17in Quantity: 4 pieces Stick this insulation on your window to block wind, noise, dust, and bugs. This window seal is transparent and fits perfectly anywhere. This window weather stripping is equipped with a four-blade and has an excellent blocking effect. This window insulation is a semi-permanent product and is exceptional in blocking bugs, dust, noise and cold air. It is easy to install and anyone can do it easily and quickly. Home weatherization is an easy and affordable do-it-yourself project that can be done all year round to help block drafts and air leaks that lead to high heating and cooling costs. Cracks and gaps around windows and doors can cause drafts to come into your home, leading to high heating and cooling costs. 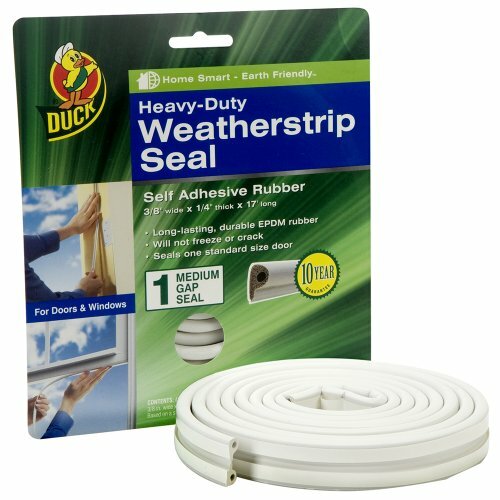 Self-Adhesive Duck Brand Heavy-Duty Weatherstrip Seals are made with durable and flexible material, allowing them to stand up against extreme temperatures that cause other seals to freeze or crack. 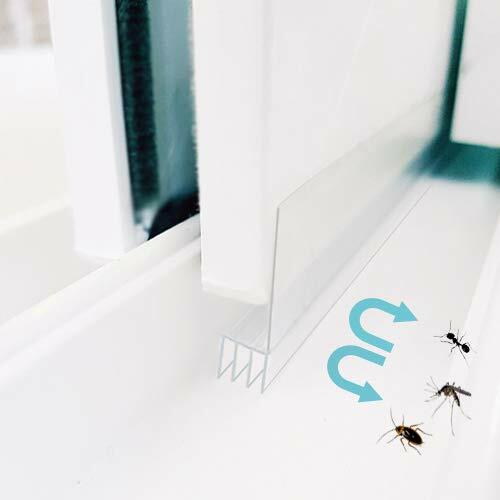 They are a great solution for replacing old or worn door and window seals, forming a barrier against the outdoor air, as well as dust, pollen and insects during the warmer months. Use together with other Duck Brand weatherization products to make your home more comfortable and energy efficient all year long. STYDDI Door Seal, Door Draft stopper, Under Door Sweep Weather Stripping is a good helper to solve your problems! Sound Insulation Three layer design reduce sound up to five times. With this door buttom seal, you won't suffer from the noise any more. Keep Bugs Off There always some bugs climb through the crack under the door. With this door bottom seal, you will say ByeBye to the bugs. Energy Saving Door Bottom Seal is the most efficient solution to stop the heat from escaping during winter and great stopper to keep in the cold during summer, help you reduce electric cost. Easy Installation Super easy to stick to the door and trim to size. Fast and easy installation within 2 minutes Specification Length: 5cm x 100cm Color: White Material: Silicone Seal gap: Up to 28mm Installation Step1: Measuring an accurate length of your door; Step2: Clean the door bottom with a dry rag; Step 3: Crop the Weather Stripping; Step 4: Apply the sealing strip to the door; Addition For have the best adhesiveness result, please heat the gel/gum by hair dryer when the install environment temperature is under 50 . 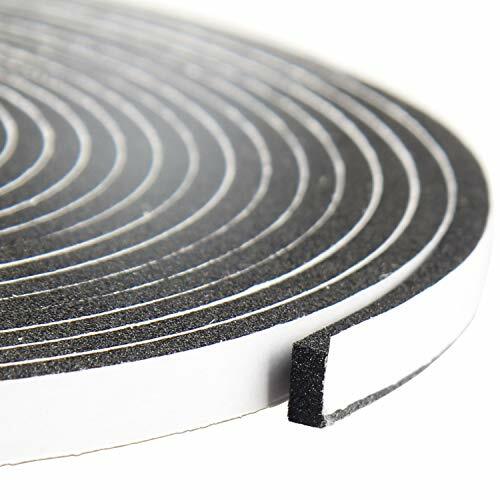 You should be careful about measuring the amount you want the bottom to touch the ground, otherwise the constant movement and friction may tear off the adhesive part. If you need to remove the product, please be slow and careful, furthermore, heat the tape is an effective way to remove the tape without adhesive left. You can use the pushpins to fix it more firmly if the door surface is not smooth. Energy Saver - Save energy and your money! 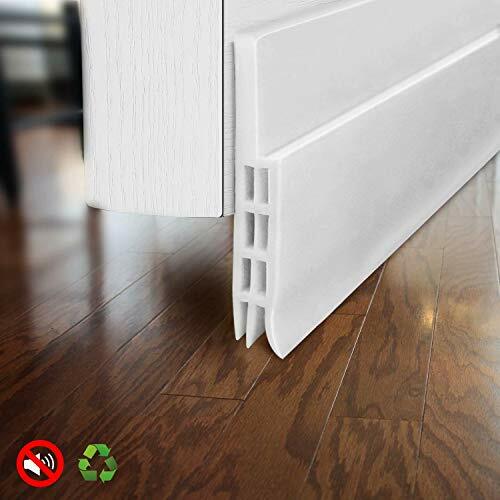 Door draft stopper makes heating and cooling your home more efficient. This seal can help plug the gap in the door, keep the temperature and lower the electricity. Energy loss through the bottom of doors can be minimized with the installation of a door bottom seal. More Efficient and Durable - Soundproof three layer design, isolate external annoying sound and it is effective to prevent the quality of sleep caused by light passing through the door. The STYDDI under door seal keeps out noise, dirt, dust and drafty layer by layer and keep your room quiet, clean. Strong Self-Adhesive - Unlike the old sealing strip, this seal strip has strong 3M VHB adhesive backing. Let you to stick to doors of different materials. such as wood, metal, plastic etc. Easy Installation - You can cut to different size according to your need, then peel and stick. The door seal strip can cover up to 1.5 inch gap. Please DO NOT open and close the door high frequently within 24 hours after installed. High Quality Material - Made of 3 lays high quality environmentally friendly silicone, non-toxic and true material. Not easy to be deformed while using, high resilience and no damage to your floor. All these make it be the best door weather stripping you ever bought. 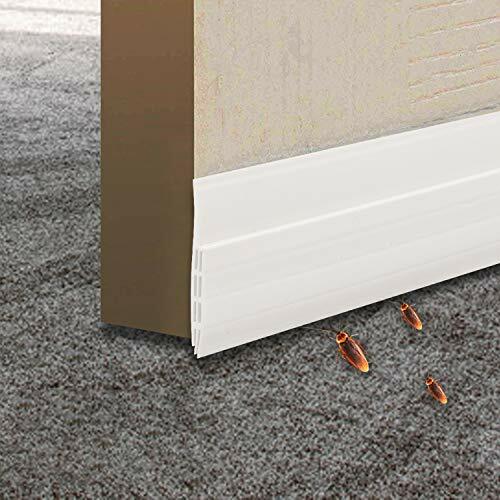 SMART DOOR DRAFT STOPPER - Fowong design it as an efficient door insulation, filled with polyester wadding, especially add glass bead to make this draft blocker heavier than any other similar products. Also hard wearing sofa cloth gives the door weather seal longer life to help you block door draft. FUNCTIONAL DOOR SWEEP - Prevent wind, dust, noise, light and polluted air coming in from your door bottom. It is not only a door sealer, but also works well as absorbing water under your door. A good home supplies for everyone. ENERGY SAVING - The best weather stripping for doors to help you block outside air flow in and inside air flow out, reducing the heating & cooling cost, save your electric bill. 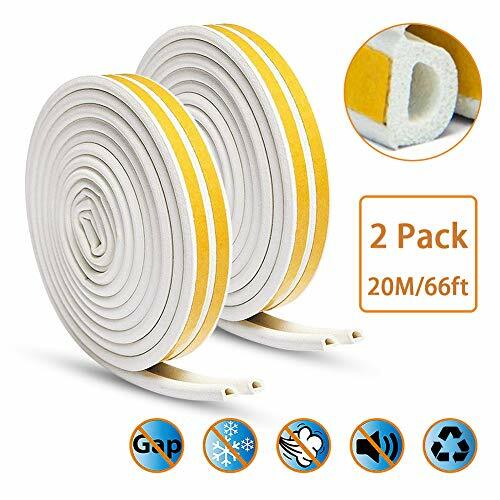 CONVENIENT TO USE - Innovatively use Hook&Loop strip, the soundproof door sweep covers your door gap perfectly; Convenient to open and close the door, avoid repeatedly placing the strip after opening the door; Sewn in rope loops for easy hanging when not in use. Can be quickly cleaned by washing machine, no more hand wash, save your time and labour. EASY INSTALLATION - Total tool free, just apply included hook&loop strip to your door, then stick the door draft stopper. 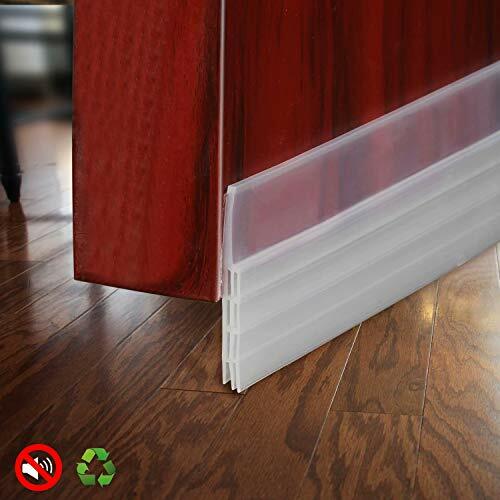 dalina Door Draft Blocker,Spandex Weather Stripping Door Bottom Seal for Soundproof,Windproof and Prevent Bugs, 31.5"
The roll is 1.875 inches wide and 30 yards long. Tape is 1.5 mil thick. REDUCE YOUR HEATING AND AIR CONDITIONING COSTS - This Attic Stairway Insulator prevents air flow between your home and attic through the attic stairway. The insulator is sized to ensure a tight fit with your existing Attic Stairway - reflecting radiant heat, keeping out cool drafts in the winter, and keeping heat out in the summer, saving you energy and money. 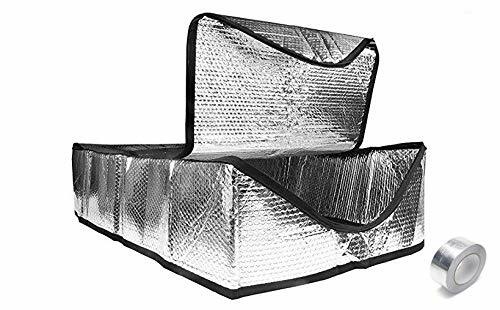 LOW FRONT OPENING AND CONVENIENT ZIPPER - The Attic Stairway Insulator has a low-profile front opening making access your attic safe and easy. A zipper from the inside of the cover allows for convenient opening and closing of the insulator. INSTALLS QUICKLY AND EASILY IN MINUTES - Our Attic Stairway Insulators are installed quickly and simply. Complete installation instructions come in every package. ALUMINUM TAPE ROLL INCLUDED WITH EVERY PACKAGE - We include a roll of Aluminum Tape to seal off any small gaps and staples/nails. The XFasten Black Foam Weatherstripping Tape is a heavy-duty foam seal tape that is designed to take a beating. Its secure adhesive is rated to last up to 5 years of constant exposure to harsh weather but will not damage the surface nor will it leave a sticky residue. 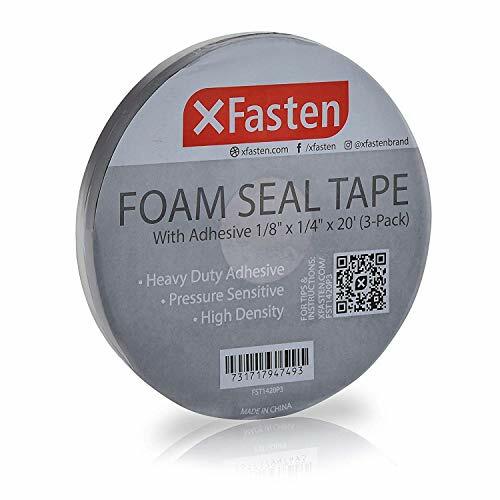 The XFasten High-Density Closed Cell Neoprene Tape is a versatile foam tape that can be used on doors, sliding doors, glass, air-conditioning unit gaps, door bottom, plastic-steel and aluminum windows, cupboards, wardrobes, and shower rooms. 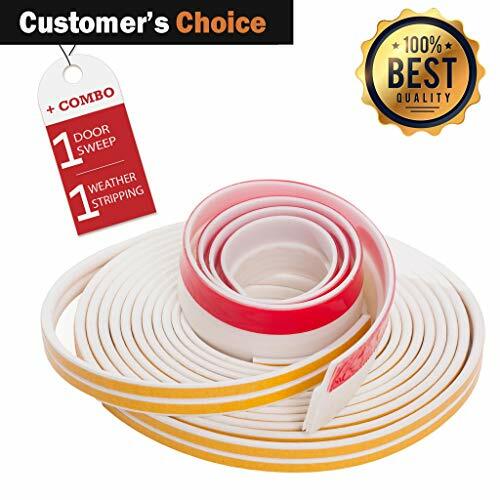 This thick AC insulation strip tape is also a great vapor and odor insulator as it is waterproof and non-absorbent. Why Should You Have The XFasten Thick Foam Seal Tape? 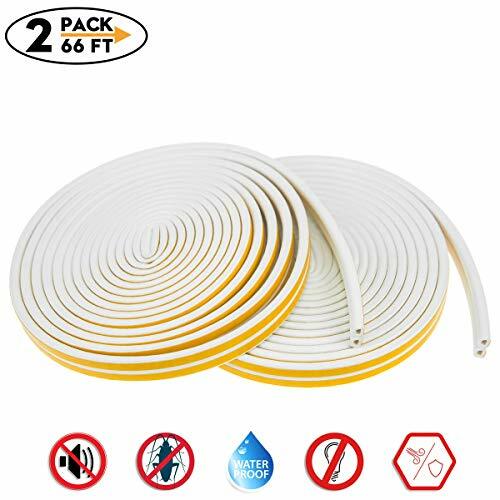 Say goodbye to odor, air drafts, moisture, dust or other hazardous and unpleasant elements as this weather strip is non-absorbent and weatherproof, which means that it repels dirt, grime, oils and odor even on a heavy-duty and industrial set-up. Easy to work with, manageable and can be cut and conformed to various shapes and sizes, making it a great foam strip to doors and windows. Shock and impact absorbent, making it ideal for heavy-duty applications. This Foam Seal Tape is made to take a beating! Door and Window Foam Seal Tape that delivers heavy-duty insulation and weather stripping to prevent air draft, vapor, moisture, odor and noise from permeating to your home. 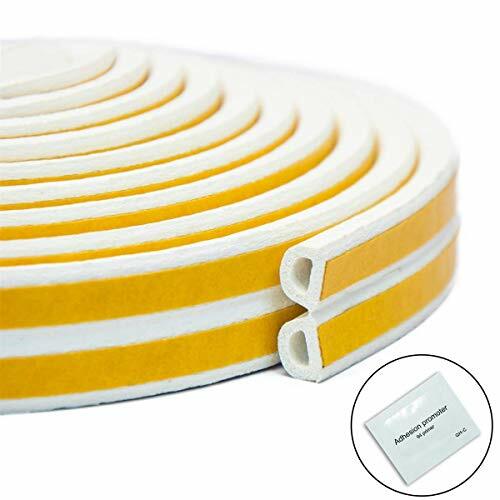 Insulation Foam tape's easy-to-cut cells EMPOWERS the AVERAGE AMERICAN with little to no experience in home repair to produce PROFESSIONAL-grade AC, window or door insulation. 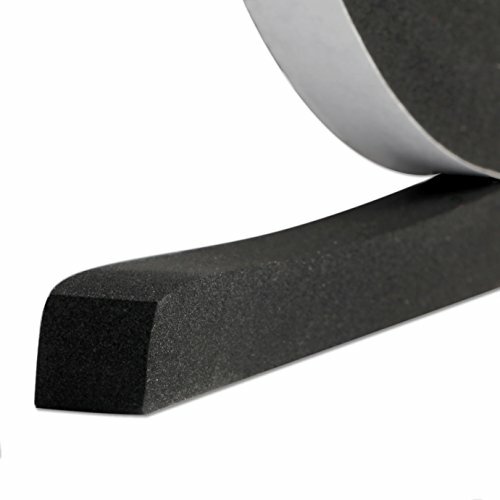 This high density foam tape is rated to withstand temperature ranges of -50 to 150 . 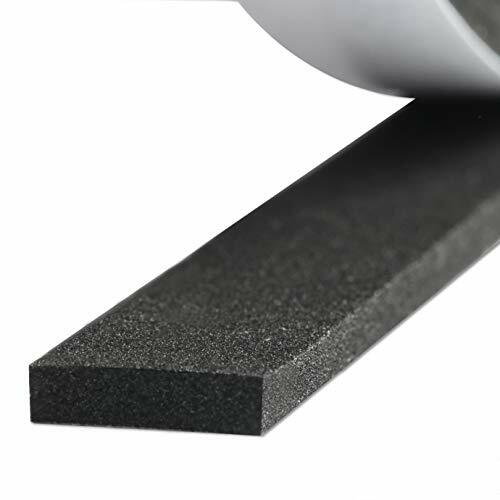 Thick neoprene foam strip absorbs sound, heat and shock well. Ideal for doors, glass, windows, sound dampening, pipe and air conditioner insulation. Mess-free adhesive will not gum or ooze and will not damage the surface upon removal. Perfect closed cell sponge strip insulation for door, window seal, HVAC and insulation. Suitable Door Material: Wood, Glass, Metal, Plastic. If you need to remove the product, please be slow and careful, furthermore, heat the tape is an effective way to remove the tape without adhesive left. 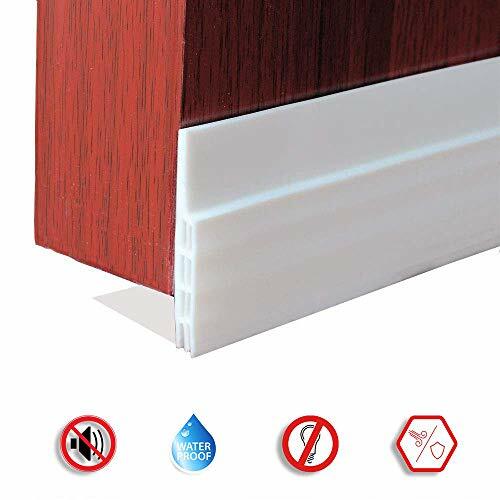 ANY KIND OF DOORS:Under door sweep weather stripping door bottom seal strip Can be used on interior and exterior doors of all types,Can also be cut to different size according to your need.